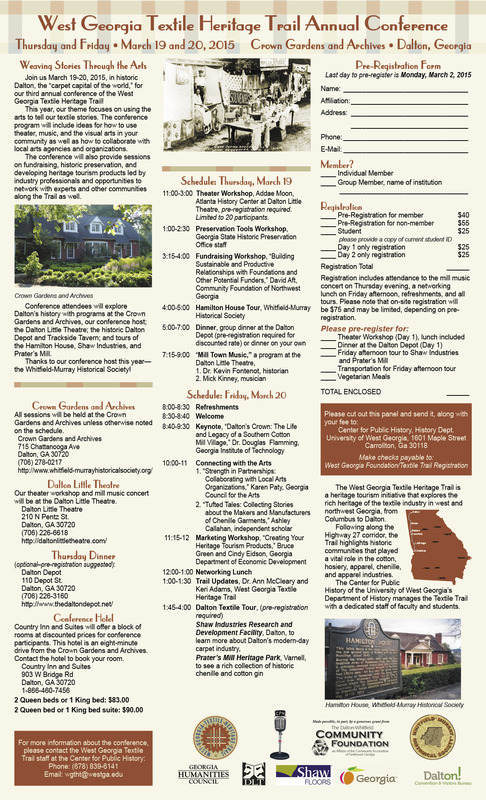 Join us March 19-20, 2015, in historic Dalton, the “carpet capital of the world,” for the third annual conference of the West Georgia Textile Heritage Trail! This year, the conference theme focuses on using the arts to tell our textile stories. Sessions focus on theatre, music, and the visual arts, collaborations with local arts organizations, and fundraising, preservation, and heritage tourism. Conference attendees will explore Dalton’s history with programs at the Crown Gardens and Archives, our conference host; the Dalton Little Theatre; the historic Dalton Depot and Trackside Tavern; and tours of the Hamilton House, Shaw Industries, and Prater’s Mill. Please come with us to Dalton for what is sure to be a wonderful conference with many unique opportunities! If you have any questions, please contact Maria Ross, WGTHT Conference Director, at (678) 839-6141 or wgtht@westga.edu. To learn more about this year’s conference speakers, go HERE!